In recent years, increasing numbers of radio hobbyists have wished to attach multiple receivers to the same antenna. This need may stem from a group wishing to share a single antenna on a DXpedition to a remote site, or it may be a single hobbyist wishing to operate two or more receivers simultaneously. In any case, many of us have found out that simply using a stub of wire to hook the antenna ports of two or more receivers to the same antenna is an invitation to all sorts of problems. One of the funnier problems can occur if one of several receivers hooked together presents significantly lower impedance to the antenna than do the others. Years ago, when Mitch Sams, Kirk Allen and John Bryant first "shared" a beverage antenna, Kirk and John spent a frustrating half-night wondering why Mitch's old receiver was so much superior to their more modern gear: they eventually realized that Mitch's old receiver was literally sucking up all of their DX! A second common occurrence when hooking multiple receivers together is that spurious radiations/local oscillator signals from one receiver can use the common antenna lead as a pathway to enter the other receivers sharing the antenna; this can cause serious but difficult to recognize interference or partial loss of signal. For all of these reasons and more, if you wish to operate two or more receivers, simultaneously, you will need to use a device called variously, an antenna splitter, a signal splitter or a power splitter: when referring to a receiving antenna device, most people use these three terms interchangeably. Most signal splitters are based on a fundamental building block which is a transformer-like device that accepts a single signal stream and splits it into two identical parts that are each (by the laws of physics) diminished in strength by about 3 dB, minimum. Usually, these transformer-like devices consist of a ferrite core and windings of fine wire and this building block may be diagrammed as an upside-down capital letter "Y." Antenna splitters that offer four output ports are usually simply three "building blocks" arranged in a cascade fashion, where the first unit splits the signal into two halves, which are then fed into a second rank of two splitters; those second rank splitters divide the half signals into halves again, creating four identical signals of further diminished strength. Since each transformation/splitting incurs about 3 dB of loss, it is easy to see why most splitters of four output ports or more also include RF amplification. The first antenna splitters that many of us saw were rather expensive and complex devices built with vacuum tube technology. These devices, usually purchased used from government surplus property outlets, often support 8 or 16 receivers simultaneously and contained sophisticated RF amplifiers, as well. In more recent times, smaller-scale solid-state splitters have become available commercially, intended for both the professional and serious hobbyist markets. The most commonly available splitters are 2-port, unamplified units. However, 4-port units, either with or without internal amplification are also currently available and two of the three splitter manufacturers produce a bewildering array of splitters suited for many professional communications uses. To our knowledge no technical comparisons of these rather costly devices have been published. Since both of us were interested in either purchasing splitters or building them from scratch, we recently undertook to evaluate what was available on the market. Happily, Bill Bowers, a retired engineer, has an array of professional test equipment and was interested in running the tests. John Bryant served as cheerleader and scribe of the project. Ideally, we would all be using antennas that have 50 ohms impedance, which would couple to feed lines having 50 ohm impedance that would, in turn, match the 50 ohm input impedance of our receivers. We recently published a study similar to this one which outlined tests of the impedance transformers necessary to match several forms of wire antennas (often from 200 to 2000 ohm impedance according to type and size) to feed lines that are nominally at 50 ohm impedance. All of the splitters evaluated in this study are meant to be used within 50-ohm antenna systems. Since the internal circuitry of most large splitter units are simply multiple two-port circuits which are cascaded to make, 4, 8 or 16 port units, we chose to concentrate our effort on three commercially available two-port units. We also included one home-built two port unit which was based on a design originally received from Sam Dellitt in Australia that has been published rather widely in the hobby press. In the initial testing, Bill also included one passive four-port splitter (Mini-Circuits Model ZSC-4-3B) and one six-port splitter, Model MCL, which appears to actually be a Mini-Circuits Model ZFSC-6-110. These latter two were obtained in used condition from an on-line auction. 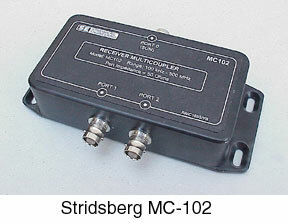 Model MC-102 was purchased directly from Stridsberg Engineering, 345 Albert Avenue Shreveport, LA 71105 Telephone: (318) 861-0660, FAX: (318) 861-7068 (www.stridsberg.com). The current retail price (2004) is $65 plus S&H. Frequency coverage, as listed by the manufacturer is 100 kHz to 500 MHz.The Stridsberg unit is exceptionally well finished and is the largest of the three commercial splitters, measuring about 5"W x3"D x1.5"H, counting the ports. The company welcomes telephone orders, for even a single unit, and does ship overseas. 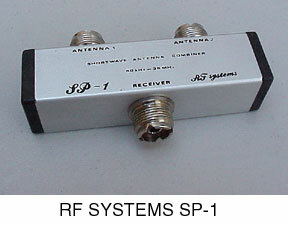 The RF Systems Model SP-1 is available from several hobby sources around the world. Our test unit was purchased for $89.95 plus S&H from our friends at Universal Radio in Reynoldsberg, OH. They accept web orders at http://www.universal-radio.com/catalog/preamps.html or sell to hobbyists by phone at 1-800-431-3939 (Orders & Prices Only) and also ship overseas. RF Systems lists frequency coverage as 50 kHz to 30 MHz. As you will note from the photograph, the SP-1 comes with SO-239 ports, so adapters were used to fit the unit to Bill's BNC-equipped test gear. The box itself is about 1" square and 4" long. However, with adapters to BNC fittings, it occupies about 4"x 4"x1" of space. 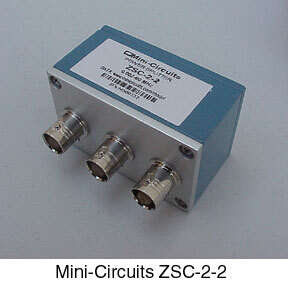 The Mini-Circuits Model ZSC-2-2 was purchased directly from the Mini-Circuit sales office in Missouri (phone: 718-934-4500, fax: 718-332-4661) for $52.95 plus shipping and handling. Mini-Circuits lists frequency coverage as 2 kHz. To 60 MHz. Despite being the largest of the three organizations and being primarily committed to the governmental and commercial markets, they specifically welcome small orders from hobbyists. They do ship overseas. They also provide excellent technical information about their products, but no ordering capability, at www.minicircuits.com The Mini-Circuits splitter is the most compact of the three, measuring 2.25"W x 1.5"D x 1.6"D, including the ports. ANTENNA IMPEDANCE MATCH: This is the impedance that will terminate the coax lead in cable from the antenna. The RG-58 has a characteristic impedance of approximately 50 Ohms and if the antenna port of the splitter has an impedance other than 50 Ohms, part of the signal will be reflected back to the antenna. The greater the impedance of the antenna port differs from 50 Ohms, the greater will be the signal loss. The amount of loss is rather complex and the total loss also depends on the length and attenuation of the coax. This impedance was measured at the antenna port with all receiver ports terminated in 50 ohms, resistive. The ideal splitter would present 50 Ohms at the antenna port. SIGNAL ATTENUATION: The attenuation of a signal, from a 50 Ohm source, as it passes from the antenna port to one of the splitter receiver ports. The other receiver port(s) are terminated in 50 Ohms, resistive. The attenuation of a signal, when it is split 2 ways, in an ideal splitter would be 3db, when split 4 ways is 6 db, etc. SIGNAL ISOLATION: The local oscillator of a receiver radiates back out the antenna connection and thus into the splitter. To prevent one receiver's oscillator from interfering with the signal going into the other receiver connected to the splitter, it is desirable to have as much signal isolation as possible. The larger the signal isolation the better. For this test, the attenuation, from a 50 Ohm source connected to a receiver port, was measured at another receiver port. All receiver ports and the antenna port were terminated in 50 Ohms, resistive. TOTAL LOSS: This is the total loss of signal as it passes from the antenna through 100 feet of RG-58A/U coax and a signal splitter. A measured signal, (-20dbm.) is fed into the coax at the antenna end and the strength of the signal at the receiver end was measured with a Fluke 8922A RF voltmeter. This is a comparison of the quality of the splitters under typical conditions. One area of some concern was noted in the Signal Isolation tests: the relatively poor performance of the Stridsberg and RF Systems units at the lower end of medium and long wave frequencies. While this would be of little concern to shortwave DXers and most radio amateurs, people with interests in the regions at and below 1 MHz should take note. We were both also surprised at the impedance mismatches exhibited by both the Stridsberg MC-102 and RF Systems SP-1 in the tests of Antenna Impedance Match, Receiver Impedance Match and Impedance Isolation. In some cases, these mismatches reached 100%. However, the measured signal losses of all three units are very nearly equal, reminding us again how forgiving receiving-only devices are of mismatches. The last test, Total Loss, is really the bottom line. It indicates that, for most uses, there is really no significant difference between the three commercial products and that a selection could be made based on price and availability. However, for the "extreme DXer" who may be unwilling to give up even half a decibel of signal, or for some technical applications, the Mini-Circuits ZSC-2-2 was clearly the best in each measured characteristic. The home-brew splitter was the second best in most tests below 5 MHz. Its performance encourages us to undertake a second project in the very near future to further develop the homebrew design.